At 7,161m high, Mount Pumori, a pyramid of snow and rock, in the upper Khumbu (Sherpa Land) Nepal, is the perfect bootcamp for Everest, but a fantastic climb in its own right. If you decide that this is one for you, you need to allow more than 30 days for the whole expedition. 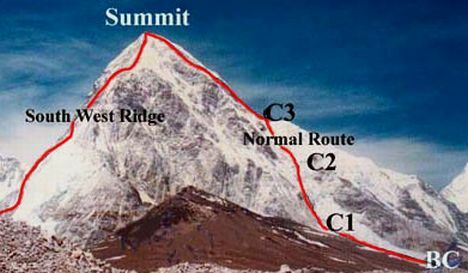 Climbing Pumori itself, however, will only take about 16 days. Pumori is considered to be technically challenging without being too difficult, but it requires climbers to be experienced as well as in good physical condition. It’s first recorded summit is relatively recent – 1964 by Gerhard Lenser on a German-Swiss expedition. He took what is now known as The Normal Route. Leopold Sulovsky and Michalec Zeduak, both Czech, opened a new route on the South face in 1996. Getting to Pumori is a trek – but a trek through magnificent countryside, friendly villages and always the lure of a view of Everest. Although high altitude experience is not necessary, it is still vital that you have the opportunity to acclimatise to the altitude and it is for this reason that the trek in takes time. To make a summit bid from base camp you need to allow at least 2 weeks as weather can be inclement. The Normal Route, graded class 3, is the easier one although there are some technically difficult parts. Base camp is at 5,300m, and a 4 hour climb from there, taking you through glaciers will bring you to camp 1 at 5,700m. Camp 2, 480m higher, is at 6,200m on slopes of between 40-60 degrees. The following day you ascend another 450m on 30-60 degree icy slopes to Camp 3 at 6,480m. The final push to the summit passes crevaces and then up the cliff face to the top. The route is mixed and varied and is best suited for strong, experienced climbers. There have been several avalanches and deaths in the past few years. The south ridge is more difficult and is mostly a snow and ice climb so knowledge of how to use crampons, ice picks etc is mandatory, but no high altitude experience is needed. The final day up to the summit is the most difficult with a 55 degree slope. Some rock climbing ability is useful here. To date this route has been casualty free. Pumori, also known as Everest’s little daughter, is frequently used by climbers to test their skills before challenging the 8,000m peaks and the views of Everest from the summit are stupendous. You can see the entire Everest route from base camp up the Khumbu Glacier to Camp 1, Camp 2, Camp 3, Camp 4 and to the summit. You can also see the route on the north side in Tibet to the summit. Pumori summitters who are using this climb in preparation for an attempt at Everest will be champing at the bit to get down and up the next one!